Arsenal legend and veteran broadcaster Bob Wilson has prostate cancer. The 72-year-old former Scotland goalkeeper, who played for the Gunners from 1963 to 1974, has cancelled his work and charity commitments. With his wife Megs, he set up the Willow Foundation - a charity which supports seriously ill young people - after their 31-year-old daughter Anna died in 1998 from a rare cancer type. 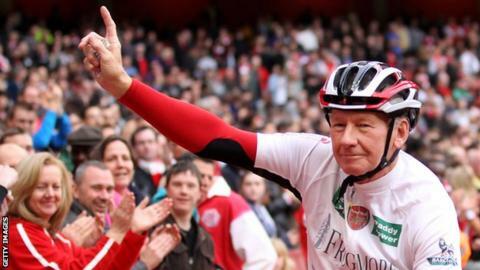 "Everyone at Arsenal FC wishes Bob Wilson all the very best following his diagnosis with prostate cancer. Our thoughts are with you Willow." Wilson requested that his privacy be respected while he undergoes treatment. After hanging up his boots in 1974, Wilson spent many years as a coach at Arsenal and also worked as a television presenter for the BBC and ITV. Wilson, who was at Wembley for Arsenal's FA Cup semi-final victory against Wigan Athletic on Saturday, said: "I am very confident that the treatment I am receiving will prove successful." His son, BBC Radio 4 presenter John Wilson, said: "Knowing how strong my dad is, I have every faith he will be back to match fitness very soon indeed." Prostate cancer is the most common cancer diagnosed in men in the UK - every year more than 40,000 are diagnosed with it. Treatment can include keyhole surgery and radiotherapy.